It is clear that most of what we think of as our mental life involves the activities of the nervous system, especially the brain. This nervous system is composed of billions of cells, the most essential being the nerve cells or neurons. There are estimated to be as many as 100 billion neurons in our nervous system! A typical neuron has all the parts that any cell would have, and a few specialized structures that set it apart. The main portion of the cell is called the soma or cell body. It contains the nucleus, which in turn contains the genetic material in the form of chromosomes. Neurons have a large number of extensions called dendrites. They often look likes branches or spikes extending out from the cell body. It is primarily the surfaces of the dendrites that receive chemical messages from other neurons. One extension is different from all the others, and is called the axon. Although in some neurons, it is hard to distinguish from the dendrites, in others it is easily distinguished by its length. The purpose of the axon is to transmit an electro-chemical signal to other neurons, sometimes over a considerable distance. In the neurons that make up the nerves running from the spinal cord to your toes, the axons can be as long as three feet! Longer axons are usually covered with a myelin sheath, a series of fatty cells which have wrapped around an axon many times. These make the axon look like a necklace of sausage-shaped beads. They serve a similar function as the insulation around electrical wire. At the very end of the axon is the axon ending, which goes by a variety of names such as the bouton, the synaptic knob, the axon foot, and so on (I do not know why no one has settled on a consistent term!). It is there that the electro-chemical signal that has travelled the length of the axon is converted into a chemical message that travels to the next neuron. Between the axon ending and the dendrite of the next neuron is a very tiny gap called the synapse (or synaptic gap, or synaptic cleft), which we will discuss in a little bit. For every neuron, there are between 1000 and 10,000 synapses. When chemicals contact the surface of a neuron, they change the balance of ions (electrically charged atoms) between the inside and outside of the cell membrane. When this change reaches a threshold level, this effect runs across the cell's membrane to the axon. When it reaches the axon, it initiates the action potential, which is a rapidly moving exchange of ions. The surface of the axon contains hundreds of thousands of miniscule mechanisms called ion channels. When the charge enters the axon, the ion channels at the base of the axon allow positively charged ions to enter the axon, changing the electrical balance between inside and outside. This causes the next group of ion channels to do the same, while other channels return positive ions to the outside, and so on all the way down the axon. In this little diagram, the red represents the positive ions going into the axon, while the orange represents positive ions going out. The action potential travels at a rate of 1.2 to 250 miles per hour! This is, of course, over-simplified, but enough for our purposes. But if you are interested in a little more detail, click here! When the action potential reaches the axon ending, it causes tiny bubbles of chemicals called vesicles to release their contents into the synaptic gap. These chemicals are called neurotransmitters. These sail across the gap to the next neuron, where they find special places on the cell membrane of the next neuron called receptor sites. The neurotransmitter acts like a little key, and the receptor site like a little lock. When they meet, they open a passage way for ions, which then change the balance of ions on the outside and the inside of the next neuron. And the whole process starts all over again. While most neurotransmitters are excitatory -- i.e. they excite the next neuron -- there are also inhibitory neurotransmitters. These make it more difficult for the excitatory neurotransmitters to have their effect. 1. Sensory neurons are sensitive to various non-neural stimuli. There are sensory neurons in the skin, muscles, joints, and organs that indicate pressure, temperature, and pain. There are more specialized neurons in the nose and tongue that are sensitive to the molecular shapes we perceive as tastes and smells. Neurons in the inner ear are sensitive to vibration, and provide us with information about sound. And the rods and cones of the retina are sensitive to light, and allow us to see. 2. Motor neurons are able to stimulate muscle cells throughout the body, including the muscles of the heart, diaphragm, intestines, bladder, and glands. 3. Interneurons are the neurons that provide connections between sensory and motor neurons, as well as between themselves. The neurons of the central nervous system, including the brain, are all interneurons. Most neurons are collected into "packages" of one sort or another, sometimes visible to the naked eye. 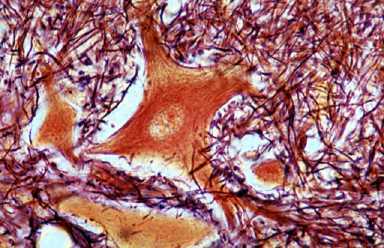 A clump of neuron cell bodies, for example, is called a ganglion (plural: ganglia) or a nucleus (plural: nuclei). A fiber made up of many axons is called a nerve. In the brain and spinal cord, areas that are mostly axons are called white matter, and it is possible to differentiate pathways or tracts of these axons. Areas that include large number of cell bodies are called gray matter.